At the most basic level a website is nothing more than a set of files written in a specific way that can be interpreted (or parsed, in web lingo) by a web browser. In order for all browsers to interpret the files the web pages must be written in a consistent manner. This consistency of form is HTML, or HyperText Mark-up Language. Because HTML is nothing more than a text file written in a specific format, all that is needed to write web pages is a text editor. Creating pages this way requires knowledge of the HTML format, and while HTML is not all that hard to learn, most people prefer a more visual way of designing pages. Applications such as BlueGriffon allow people to make functional websites by creating the mark-up language for you, based on the information you provide as you create the content. The design of BlueGriffon makes the experience of web page design very similar to using a word processor. While this makes learning the software easier for most, there are a few traps that lurk in the shadows of this kind of approach. The Hypertext part of HTML is what makes linking possible in web pages, and understanding how links work is crucial before successfully creating a website. I'll give you a brief introduction here, but I recommend further reading for more detail of how all this works. 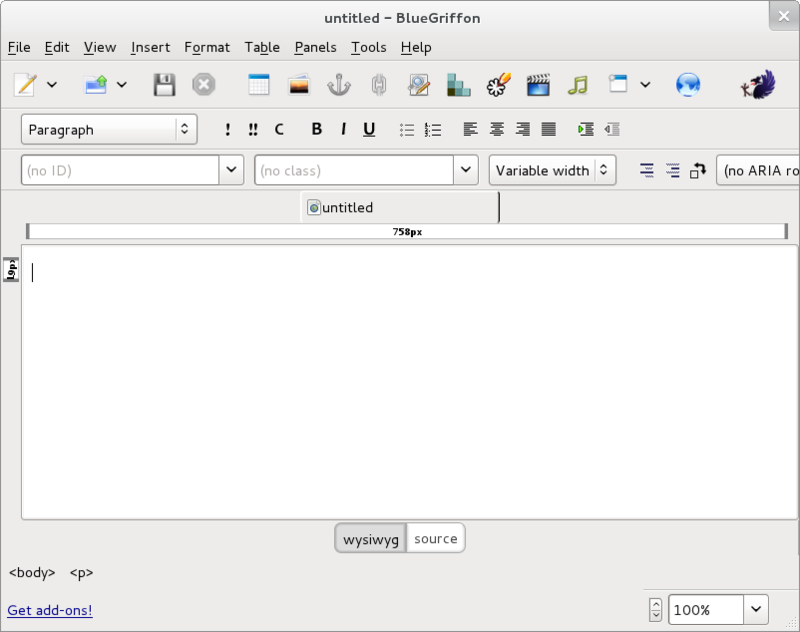 find the BlueGriffon application in the repository of your Linux distribution and install it using your favorite package manager.